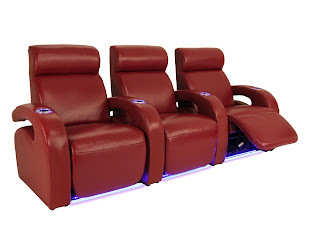 When you design a home theater, whether you're opting for jaw-dropping grandiloquence or a modest, comfortable space in which to watch movies, the seats you choose will always be a central centerpiece to the action. As the centerpiece, the stylistic design of the chair is of utmost importance. Think about it: the eye always catches first, what the body will feel later. 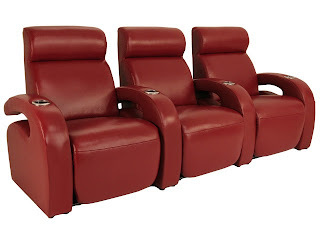 Choose the wrong theater seat to match your decor, and it won't matter how comfortable the chair or how convenient its features; it will stay an unavoidable eyesore to anyone entering the room, be it friends, family, or loved ones. When looking for the right design, you'll want something which will match with your surroundings, yet still be able to stand out as a unique, appealing design. Not an easy task--but the new Turino from Seatcraft will fit that bill perfectly. The Turino is a striking new model which combines art-deco individualism, futuristic savvy, and a smooth contemporary finish into one of the best looking theater seats you'll find anywhere. The seat's gently curved armrests will immediately catch one's attention. These armrests curve back, leaving a wide space between the armrest and the seat bottom itself, a feature which immediately stands out. At the same time, the clean lines and smooth polish of the Turino lend it an elegant grace that allows it to be matched with any number of home theater design setups. Plush, overstuffed headrests complete the picture, which provides its own curved look to both complement and offset the curve of the armrests. The Turino is about more than just looks, however. This seat is a part of Seatcraft's prized Leather 7000 series, which offers the highest quality leather at a terrific value. Leather 7000 is hand-selected from only the top 30% of outer hides, ensuring a material that offers premium texture, softness, durability, and support. The hides are then carefully buffed to remove imperfections and polished to a bright, inviting sheen. Leather, of course, is renowned for its exceptional look, constitution, pliancy, and ease of maintenance. Simply apply a damp cloth once a week to keep your chairs looking better than ever, and this leather will actually improve in both texture and appearance over time. The features of the Turino enhance its commitment to comfort. Padded headrests and a chaiselounger footrest provide full support from head to toe. Wall-hugger seating allows the seat to sit three inches from the wall even in full recline, for those looking to maximize space efficiency in their home theater. LED lighted cupholders and ambient base lighting provide a softly radiant contrast to the seat's design, accenting its highlight curves for maneuverability in the dark. For further details on this outstanding chair, please check out our Youtube video of the Turino, which points out each of these features in turn.